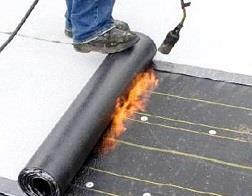 a) One way is by heating and melting method.Heat the polyethylene film of the membrane and roof deck surface by heating and melting method to be nearly melted (not flowing), then install the membrane filly bonded to the roof deck with overlaps of 5-10cm. 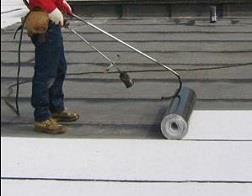 b) The other way is by cold adhesive method.Pour the cold adhesive homogeneously on the roof deck, then roll the membrane to install it to be fully sticked to roof deck. 1) High Impermeability, high tensile strength, high extension coefficient good dimensional stability, adopting shocking well to substratum contraction deformation and crack. 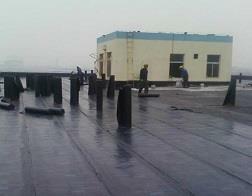 2) puncture resistance, tear resistance, corrosion resistance, mildew resistance, good weather ability. 3) Good property of resistance high and low temperature. SBS is suitable for the lower temperature environment but APP for the higher temperature environment. 4) Perfect durability, long life span up to 30--50 years. 5) Either heating and melting method or cold adhesive method, either single or multiple layer. 6) Neither dripping in high temperature nor breaking in low temperature, no pollution to environment and convenient installation. 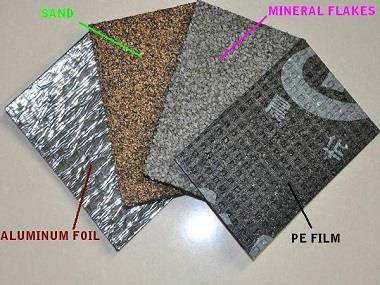 Should you have any preference for the bituminous roofing membranes, welcome to contact us for the product made in China. As a leading such manufacturer in China, we are equipped with a professional factory at your service, and we will offer you the most competitive price.